Κτισμένο το 2015, το At Mind Premier Suites Hotel αποτελεί ξεχωριστό σημείο σε Pattaya, καθώς και έξυπνη επιλογή για τους ταξιδιώτες. Από εδώ, οι επισκέπτες μπορούν να έχουν άμεση πρόσβαση σε όλα όσα η πόλη έχει να προσφέρει. Από τη βολική της τοποθεσία, η ιδιοκτησία προσφέρει εύκολη πρόσβαση σε κορυφαίους προορισμούς της πόλης. Το At Mind Premier Suites Hotel προσφέρει επίσης πολλές εγκαταστάσεις για να εμπλουτίσετε την διαμονή σας στη Pattaya. Τα δωρεάν WiFi σε όλα τα δωμάτια, 24ωρη ρεσεψιόν, ασύρματη σύνδεση Wi-Fi σε δημόσιους χώρους, χώρος στάθμευσης οχημάτων, υπηρεσία δωματίου είναι μόνο λίγες από τις εγκαταστάσεις που κάνουν το At Mind Premier Suites Hotel να ξεχωρίζει από τα άλλα ξενοδοχεία στην πόλη. Ελάτε σε ένα από τα 110 φιλόξενα δωμάτια και ξεφύγετε από τα άγχη της ημέρας με μια ευρεία γκάμα ανέσεων, όπως επίπεδη τηλεόραση, καθρέφτης, παντόφλες, καναπές, πετσέτες, που θα βρείτε σε ορισμένα από αυτά. Το ξενοδοχείο προσφέρει μια άριστη ποικιλία ψυχαγωγικών εγκαταστάσεων, όπως τα γυμναστήριο, σάουνα, εξωτερική πισίνα. Ανακαλύψτε ένα ευχάριστο μείγμα επαγγελματικών υπηρεσιών και μια μεγάλη ποικιλία ιδιαίτερων χαρακτηριστικών στο At Mind Premier Suites Hotel. money for value . nice & clean rooms . My experience was totally different from the one i had in At mind exclusive hotel and even tho the location was in small alley but the service was excellent and truly 5 star.. that wasn’t the case in at mind premier suites.. the reception staff were okay and accommodating but the restaurant staff weren’t.. they were pointing at me at one time when i was having my breakfast and suddenly one staff came at me shouting what room ? :/ in-front other guests.. which I didn’t like at all.. and when I explained to her that i have already given the other lady my breakfast coupon she left without even saying sorry..its not her fault the records doesn’t show every paying guest.. its hers when it comes to simple manners. I honestly wouldn’t be back here anytime soon. Clean (important for me coz of allergy), quiet, secure, modern, good location. Has covered parking for cars and bikes. 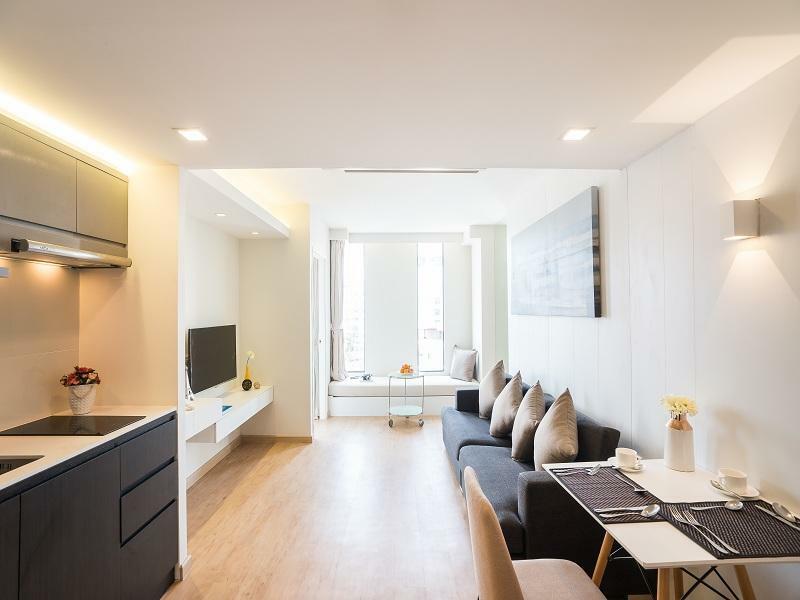 Comfortable location: 200-300 meters to Central Pattaya road & Soi Buakhao intersection. Hotel had large and good suite room equpped with small kitchen and microwave. Great if you want to have light cooking. Pool is very small. Design of the hotel eventhough hotel not so big. 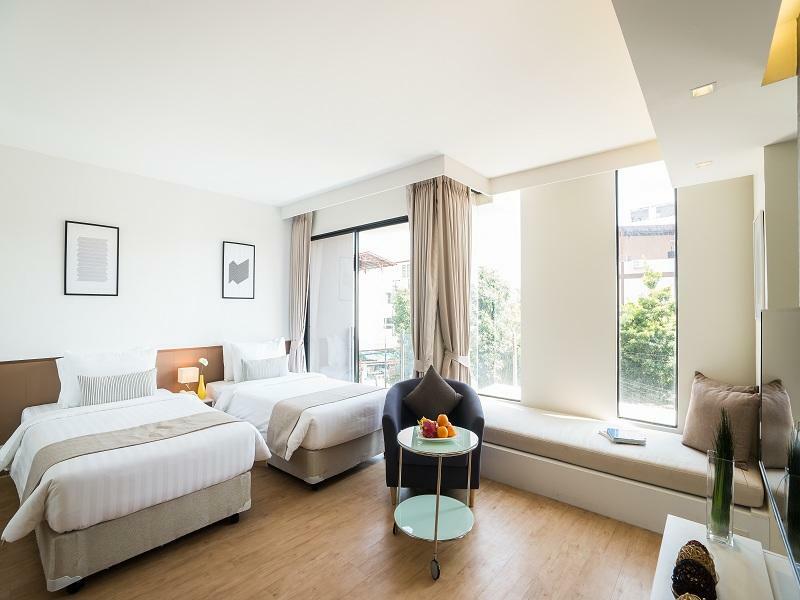 Decent hotel for your stay at pattaya. Location wise a bit inside small alley. I can't believe I paid so little and got so much. I have been to Pattaya an uncountable amount of times and have stayed in numerous hotels and condos, this is by far my favorite. It is very clean and spacious. The rooms are nicely appointed and come with a washing machine which really came in handy. The breakfast buffet had some delicious choosing. The hotel is about a 10-minute walk to the Central Festival Mall. Excellent place for a short or long stay and with the prices so low, you can't beat it. 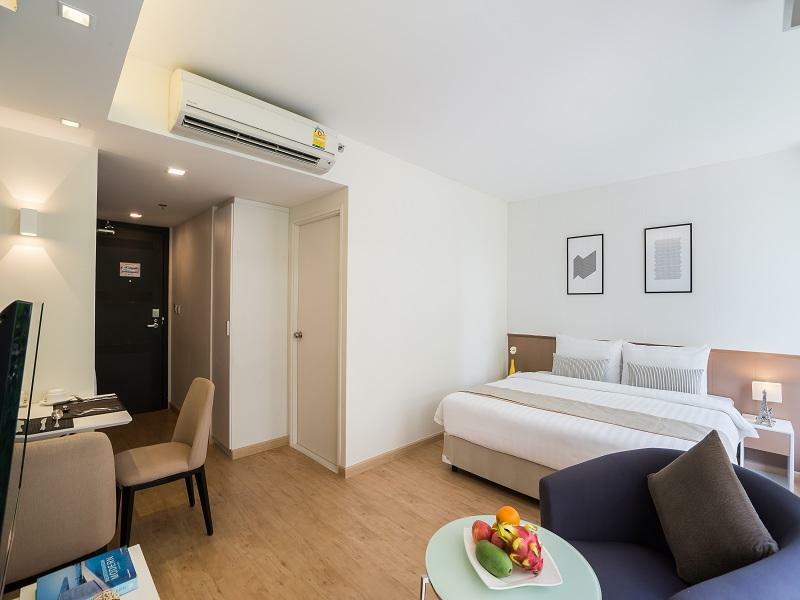 Pro's; Clean, well laid out room, modern toilet with built in bidet, smart tv, good WIFI, good aircon, seating area in room, front load washing machine in room. familymart & 7/11 nearby, car parking under hotel, motorcycle taxi nearby Con's; rock hard bed, breakfast was good but 3 days we ate at 9am, several of the dishes were empty and the staff seemed to be watching us waiting for us to finish like as if they had somewhere else to be. The access road is very narrow, slightly dangerous for walking. No clothes drying hanging rail. no iron. Small balcony is adequate for 1 person only. don’t know where to start ... but don’t think I want to stay here again ! If you are looking for a clean room and nice breakfast this is probably not ideal. We stayed here for 6 nights and only good thing is The room is equipped with washing machine BUT there’s nowhere to hang the clothes. Cleaniness of the room needs to be improved ! limited choices for bfast and we got refused to refill the tea bcoz it is 1 minute past the breakfast time ?!? Hotel Staffs not very welcoming and friendly unlike other hotels. Would be nice to see more smile and greetings ! About the hotel .... it is about 20 mins walk to the beach and there is a 7-11 about 5 mins walk. Good thing is it provides free shuttle bus service to central festival and central marina which is just across the beach. If you would like to spend more time at the beach it would be better to stay near the beach instead. The drive for shuttle service is actually helpful and nice although he sounds rude ! Anyway .....Thank you ! The hotel is good for stays longer than 3 nights - you have a washing machine in some of the rooms to keep up and a smart TV with access. The breakfast buffet was very good with both breakfast and lunch options. The location of the hotel requires some extra effort to get to the beach or nightlife, but that is the only negative from my opinion. Bad receiptionist attitude. Mis-took their laundry bag as i thought it is free. Was asked to return it during check-out time, but the way the receptionist said it as if i was trying to steal it. She said, as i quote "give it back!". Hot water tap is not functioning well. Overall experiences with this hotel ... bad ... avoid it at any mean. And i noticed most of their customers' reviews are "fake" as the hotel is buying good reviews with free breakfast. Ive been visiting lots of hotel due to my business. and @mind group is my biz partner as well, so whenever i comedown to pattaya, i using @mind (mostly executive hotel im using) hotel. this time, i had invited some of my friends to pattaya and book 5rooms for their overnight staying. however our golf was finished quite late so i called to reception and reception lady (Name : K.Nok) answered my phone call with very much impolite manner and was rude, so i told her in the end that "could you answer to ur customer a little bit kinder than this?" her reply was even worse... "Oh~ we are waiting ok?!" with very bad tones of voice. since its budget hotel, i don't except that much hospitality, however this was way out of it. and about room. 2 of my my friends complained that too bad food smells in side room when we entered. one was at 5th floor, and the other was 3rd floor. defiantly i will re-inform to @main group about her behavior and i wont stay again. This is old furnished hotel. The room was not as good as it was on the commercial. Bed was old and hard. Lobby was small. Frontdesk was not really helpful. When asking for advice about local taxi (thong xieo), she told us to bargain with the driver for the drive (around 200-300THB/3km trip despite the fact that it only cost 10THB/road. Thailand seems to try its best to cost tourist as much as possible. The facilities very comfortable with sauna, swimming pool and fitness center. However, the bathtub is quite small. The staff is kind, friendly and helpful. just only 2 days but it makes my honeymoon is memorable. Thank you so much, I will come back in future. Τερματικός Σταθμός Λεωφορείων Pattaya στα 1.97 χλμ.